As warm weather finally settles upon us, young children are eager to run, explore, and burn off energy. If your backyard has grown a little stale, or the local playground has gotten too crowded, pack some snacks and water, lace up everyone’s sneakers, and a hit a nearby trail. 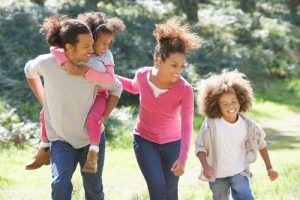 Kid-friendly hikes are abundant in the area, and you and your family will have the chance to explore nature while getting exercise and fresh air. If you are looking for a fun and education child care for the summer, call Child’s World Academy. The Webb Mountain Discovery Zone, in Monroe, CT, is a 170-acre park with three loop trails. Webb Mountain provides an interactive, hands-on learning experience. An outdoor classroom is perfect for schools and group visits, and Webb Mountain’s scavenger hunts are fun even for younger children! Since it’s heavily geared toward children, you’ll find that the trails and amenities make for an exciting yet convenient day outdoors. Also located in Monroe is Wolfe Park, a 309-acre location with a host of fun activities in addition to its beautiful trails. If your kids decide that they would prefer swimming to hiking, there is an outdoor pool and a lake with a beach. This multi-use site is great for a day trip. In Peekskill, NY, Blue Mountain Park is an enormous stretch of land occupying 1500 acres. Kids can hike on the beautiful terrain which overlooks the Hudson River and passes by streams and ponds, as well as a thick, hardwood forest. There are biking trails and fishing areas for older kids and adults, too. Just across the Hudson River from Peekskill is Bear Mountain Park, home to a diverse array of trails for you and your kids to explore. There are shady areas for picnics, a swimming pool, bike trails, and access to lake and river fishing. There is even a merry-go-round featuring hand-painted scenes of the park and carved seats showcasing the animals which make the park their home. Devil’s Den, along the Saugatuck River in Fairfield County, CT, is a nature preserve which provides access to low-impact trails and views of a variety of different habitats, including the river, wetlands, woodlands, and wetlands. Many different animals make their home at Devil’s Den, and it’s a great destination for kids who are interested in animals and animal habitats. 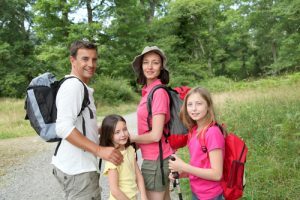 Where are your favorite destinations for family hikes in Westchester and Fairfield counties? Let us know in the comments section! Call us today if you are looking for fun and educational child care. We have two convenient locations, in Monroe, CT and Peekskill, NY. Call and schedule a tour to see our facility and meet our staff.